The Jambu fruit dove is a forest dove that inhabits the second growth forests of mangrove swamps and rainforests on the Indonesian islands of Sumatra and western Java, and the countries of Thailand and Malaya. They are easily recognized in the forest by their soft cooing. wingspan is between 3 to 6 inches. Its feathers are downy soft and very colorful. The feathers come out easily, which makes them hard to catch. The male's face and forehead are crimson to pink. The upper part of their throat and chin are black. Their underparts are white with a pink breast patch. Their upper parts are a forest green. The outer parts of their tails are a darker green than the body, and the underside is a chestnut color.The feet of the Jambu fruit dove are a dark red. The female isn't as colorful. She is mostly a darkish green with a purple head, and a white to cream belly. The underside of her tail is a brown color. They are a shy and inconspicuous bird, their green feathers acting as perfect camouflage. They spend most of their time roosting, nesting and feeding. They are mostly seen alone or in pairs, but will gather into a large flock when feeding at a fruit tree. They eat fruit directly from the trees, or that which has been dropped to the ground by monkeys and hornbills. Their nostril are raised high on their upper bill like most doves. The Jambu fruit dove can put its entire bill in the water and drink by sucking it in. Most birds can only dip part of their bill in water, so as not to submerge their nostrils, and then have to tip their heads up to let the water trickle down their throats. Jambu fruit doves have a breeding territory, which they announce by raising their wings, and cooing while moving their heads forward and bobbing the body up and down. They also aggressively defend their territory with a quick peck if their threat display doesn't work. A pair of Jambu fruit doves will build a flimsy-looking nest of twigs, roots and grasses interwoven with branches of the tree. The male provides the material and the female builds the nest. They usually lay 1 egg, sometimes 2. The egg is incubated by both the male and female for 2-3 weeks. The nest is never left alone during incubation. Both parents help in raising the hatchling. Within an hour of its birth,the helpless hatchling will be fed dove's milk, a nutritious secretion that both parents make in their crops. The chick's early development concentrates on growing feathers and becoming coordinated instead of growth. Around the 10th day its eyes open for the first time, but its wings will already be functional. Shortly after that it leaves the nest with its parents, who stay very close. The chick is then weaned at 8-10 weeks. The young male will look a lot like a female in coloring, but by 9 months it will have its full coloring. Although the Jambu fruit dove isn't endangered, they are listed as threatened. They can still be found in Borneo and Sumatra, but are now rare on West Java. Their habitat, the rainforests of Southeast Asia, are rapidly being lost. "Asian Rainforest: Jambu Fruit Dove", http://www.oaklandzoo.org/atoz/azjfdove.html, (Nov. 2001). "Jambu Fruit Dove", http://www.chaffeezoo.org/zoo/animals/fruit_dove.html, (Nov. 2001). 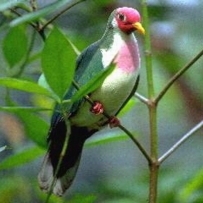 "NatureZoo.com-Jambu Fruit Dove", http://www.naturezoo.com/birds/jambufruitdove.htm, (Nov. 2001).